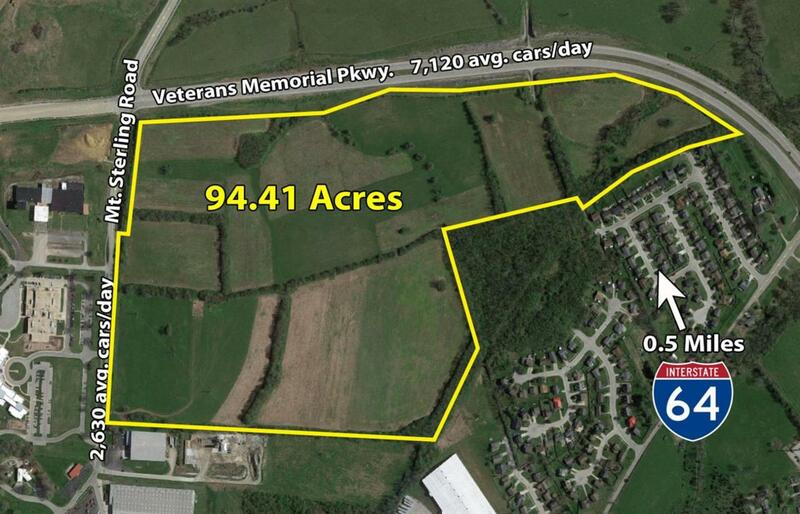 Mixed use potential for land development approximately mile from the I-64 interchange at the signalized corner Mt. Sterling Road (US Highway 60) and Veterans Memorial Parking (KY Highway 1958). The preliminary and conceptual Development Plan is slated to 54.8 acres of I-1 (Light Industrial), 13.7 acres of B-4 (General Business),18.6 acres of Multi-Family, and 7.3 acres of green space for a total of approximately 94.41 acres. The site has over 3,500 feet of road frontage on Veterans Memorial Parkway and 1,600 feet of frontage on Mt. Sterling Road. All utilities are at or in close proximity to the site. Listing provided courtesy of Lara Thornbury of Block + Lot Real Estate. Listing information © 2019 LBAR Multiple Listing Service. All rights reserved.